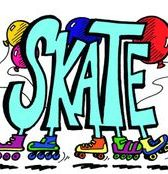 Join us weekly for Christian Skate Night. This is a wonderful time of outreach, fellowship, and fun. Must sign-up if you need a ride. Van leaves our house at 2:30pm. •We will stop at Popeyes ($3.99 2 pcs, 1 side, biscuit & sm drink) or wherever currently has a special going on for an early dinner before skating.